Hero Spotlight time! Let’s take a look at…. Costello is a unique support hero who empowers his allies through song. 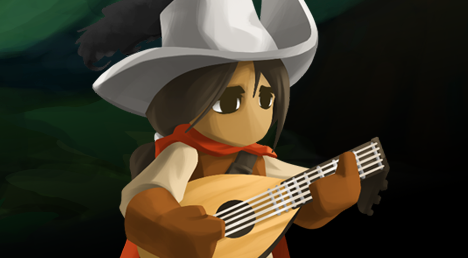 WIth his trusty lute, he can heal his allies and strengthen their stats. We’ve made some changes to how he works compared to the original Battleheart Bard (Edwardo), but the general idea is similar. One thing of note about Costello – he is unable to target enemies or allies. Unlike our traditional Cleric healer, Costello doesn’t target an ally to heal them, but simply pulses healing at all times in a circle around him, an ability we call “Song of Peace”. He’s therefore able to produce a lot of healing to the group, but it is less focused on a single target, making him less suited to handling extreme damage on your tank, for example. Transpose: The cornerstone of Costello’s kit, Transpose toggles his Song of Peace described above into the Song of War. This ability has no cooldown, so you can freely switch between Peace or War at any time. Where Song of Peace slowly heals nearby allies at all times, Song of War grants attack power to your allies instead. To maximize Costello’s impact in battle, you’ll want to use Song of War as much as possible to maximize offense, and switch to Song of Peace when healing is needed, all while making sure Costello is standing near his allies to maximize the effect of both songs. He might take a little more micromanagement than other support heroes, but he can be a powerful addition to the group. Talents can further emphasize the strength of either song, increasing the healing or offensive characteristics of each. Of particular interest is that Costello can have Song of War also confer his own crit chance or bonus skill power to his allies, making it possible for him to essentially act as a bonus item slot for other heroes. Power Chord: This skill empowers whichever of your two songs (Peace or War) is active at the moment, performing a different effect for each. If Peace is active, Power Chord applies a large heal-over-time effect to the entire party. As you might expect, the War variation is a percentage-based damage boost to the whole party. Talents can grant Power Chord two charges, or add additional effects, such as a haste boost during Song of War. Inspiration: Further cementing Costello’s role as the ultimate enabler, Inspiration immediately resets all of the party’s cooldowns. This ability has a long cooldown itself, but allows for enormous potential, particularly if combined with a timely Power Chord during Song of War. Empowering the whole team and letting them cast all of their abilities twice is a recipe for huge damage.